Not many Rotterdammers are aware of the existence of De Tempel, while in fact this special place belongs to them. I am a seasoned explorer but for years even I have been passing by this place without even noticing it. Until one day my eye fell on a small plaque on the fence saying “open to the public on weekends and holidays”. Needless to say next weekend I was on the grounds exploring and what I found was pure magic. 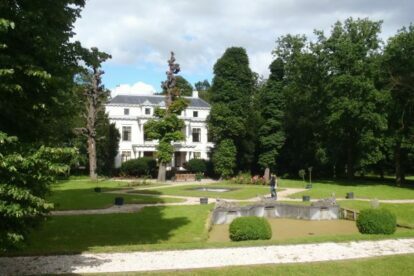 Shortly after WWII the Van Beek family, owners of De Tempel, sold it to the city of Rotterdam on the condition that the estate will be accessible to the public, and it still is. The shady park around the mansion is quite vast, and a bit creepy, especially considering the fact that until recently the place was a mental institution. The 6 species of bats residing here make the Addams Family atmosphere complete. If you do dare to visit, you get to experience a unique location, home not only to bats and nuts, but also to over 50 different bird species. De Tempel is now home to temporary residents. Officially it is open to visitors on weekends and holidays, but the gate is open during the week as well, so you may try to sneak in.